Netgear has launched its first routers that support the next-generation of Wi-Fi standard. The Netgear Nighthawk AX8 and Nighthawk AX12 are premium routers that are capable of high-speed connectivity, but the key highlight of them is the support for the next Wi-Fi standard, Wi-Fi 802.11ax, or as per the new naming scheme, Wi-Fi 6. The new routers from Netgear come with upgraded specifications and entirely new designs. 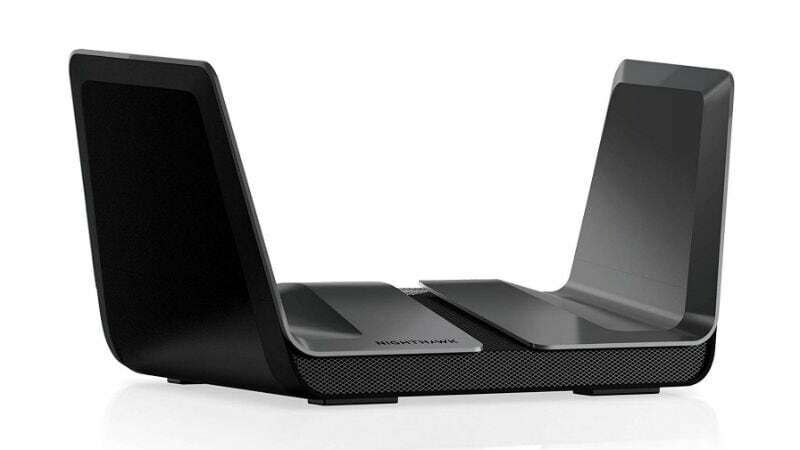 Replacing the multi-antenna routers that recently became popular, the Nighthawk AX8 and Nighthawk AX12 feature a very futuristic design where the antennas remain upright. While the Nighthawk AX8 is currently available for pre-order, the Nighthawk AX12 will make it to retail next year. As mentioned, the Netgear Nighthawk AX8 (RAX80) 8-Stream Wi-Fi router supports the new Wi-Fi 802.11ax (also known as Wi-Fi 6) standard, with speeds up to 6Gbps. The company is touting that the router can deliver up to four times more data capacity than previous standards. Wi-Fi 6 supports technologies like OFDMA, MU-MIMO, 160MHz channel support, and 1024 QAM. Notably, the Nighthawk AX8 is powered by a 64-bit 1.8GHz quad-core processor that is claimed to transfer gigabytes of data with “almost zero CPU load”. Also, its 160MHz channel support is said to double the speed offered by 80MHz channels to provide Gigabit speed to compatible devices. Netgear says that the Nighthawk AX8 is the world’s first home router with Multi-Gig Internet support that it achieved by aggregating two gigabit Ethernet ports. The router is claimed to be ready for the Multi-Gig Internet wave coming in Docsis 3.1. The Nighthawk AX12 12-Stream Wi-Fi router also supports Wi-Fi 6. It is claimed to provide combined Wi-Fi speeds up to 6Gbps. It is powered by an AX optimised 64-bit 2.2GHz quad-core processor, for high-speed connectivity required for smart home applications, 4K UHD streaming, online gaming, and more. It comes with eight high-performance antennas to amplify Wi-Fi signals for maximised range and reliable coverage. The Nighthawk AX12 is also Netgear’s first home router with a 5Gig port, the company claims. The Nighthawk AX8 comes with two 4×4 antenna arrays, one for 5GHz Wi-Fi and another for 2.4GHz. It has five Gigabit Ethernet ports and supports a total of 6GHz of wireless throughput. The Nighthawk AX12 comes with a similar set of features but includes an 8×8 antenna array for its 5GHz network. In terms of pricing and availability, the Netgear Nighthawk AX8 costs $399.99 (roughly Rs. 28,900) and available for pre-order via Amazon. The Netgear Nighthawk AX12, however, will come sometime in 2019 and the pricing is still unannounced. Netgear has also introduced a subscription-based ‘Wi-Fi as a Service’ programme with the Nighthawk AX12. It is a beta-testing programme that allows users to try the device for 90 days, and pay if they light the device.